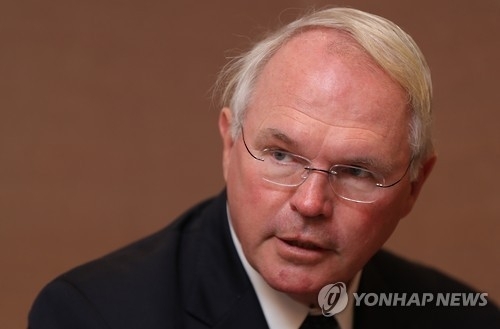 WASHINGTON, March 26 (Yonhap) -- No good military options exist on North Korea and the best way to deal with the provocative regime is to increase cooperation with China, former U.S. nuclear negotiator with North Korea Christopher Hill said Sunday. Talk of pre-emptive strikes against the North have gained traction after U.S. Secretary of State Rex Tillerson said earlier this month that diplomacy failed to disarm the North and the United States is considering a new range of options, including military ones. "We say 'everything is on the table' is because basically none of the options are particularly good options," the former negotiator said on New York's AM 970 radio, according to the newspaper Hill. "There are no good military options. "We've done a lot on sanctions. It's the most sanctioned country in the world. That hasn't worked. We tried to have negotiations with them. That hasn't worked. But I think what could work is a much better understanding between the U.S. and China," Hill said. He expressed concerns about the rapidly worsening threats from the North. "In the last few years, North Korea's threat has really grown ... now we are seeing them modernize their missile arsenal, such that it's quite likely in the near future ... North Korea will have a deliverable nuclear weapon. And then the question is, what are we all going to do about that?" Hill said. "I wouldn't want to be Donald Trump in 2020 and have to say ... we couldn't do anything," he said. Hill, who also served as ambassador to South Korea, said that beefing up the defense of South Korea and increasing cooperation with Beijing are the best ways to deal with the North's threats. "We are going to have to thicken up our defense of South Korea ... and I think we are going to have to really work more with China," he said.